Create a Santa-worthy arrangement of dazzling treats and be the hit of the holiday cookie swap circuit with our round-up of the best-ever Christmas cookie recipes. You'll find all our favorite cookies to bake and share this winter (don't forget to brush up on our essential cookie-baking tips and tricks). From gingerbread cookies and shortbread cookies to ugly Christmas sweater cookies and Snicker cookies, The Spruce has you covered this holiday season. The Ugly Christmas Sweater Party is a fun and cheeky modern holiday tradition that's really caught on. 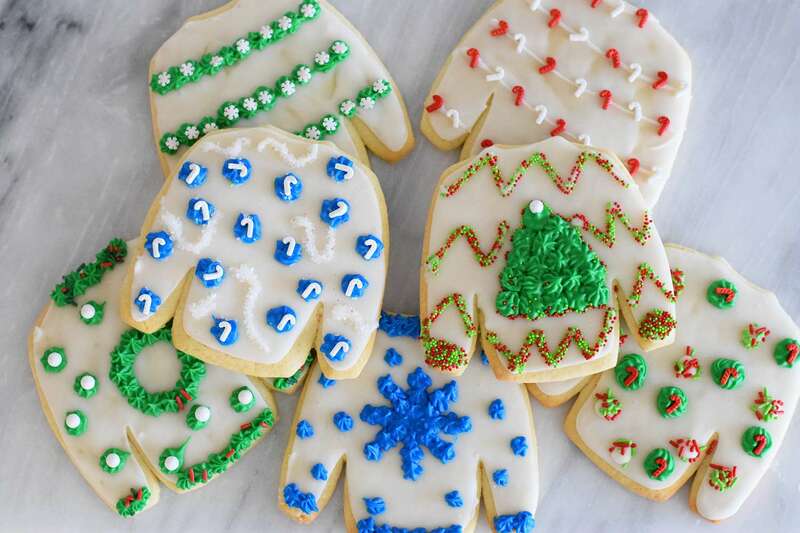 Take your traditional Christmas cookie swap to the next level this holiday season, or be the hit of your Ugly Christmas Sweater office party, when you show up with a batch of these adorable, creative cookies "dressed" in ugly Christmas sweaters made of icing. What would a Christmas party be without traditional gingerbread cookies? These gingerbread Christmas cookies are as delicious to eat as they are fun to make. Get the kids involved in rolling out the dough, cutting the gingerbread people shapes and decorating the cookies with icing and their favorite candies. It's a wonderful holiday treat that can become a fun Christmas tradition for your family. Everyone's favorite cookie flavor combination of chocolate and peanut butter combine in these scrumptious, easy cookies that require absolutely no baking at all. Your microwave is the key to making these kid-favorite cookies, which come out tender, creamy and nice and chewy in the middle. Got guests coming for the holidays? Bake up a batch of these super easy, cute and delicious cookies made with 6 ingredients you probably have in your fridge already. Buttery jam-filled thumbprint cookies are a holiday classic, and make a great Christmas Eve cookie for Santa's plate. Austrian Linzer cookies are an absolutely beautiful, traditional Christmas cookie recipe that adds something quite special to Christmas party tables and holiday cookie swaps. In this classic Linzer cookie recipe, pairs of buttery, delectable shortbread cookies are sandwiched together with jam that peeks out through the decorative cutout in the top half. Who could resist a fabulous, giant cookie stuffed with a candy bar? Get ready for oohs and ahhs when you bring a batch of these unbelievable, decadent and delicious Snicker Cookies with a candy bar surprise inside to your Christmas cookie swaps or office holiday party. Christmas shortbread cookies are a wonderful, traditional holiday treat. Just the smell of shortbread baking in the kitchen lets you know that Christmas is coming! This Christmas cookie recipe for shortbread is dairy-free, making these cookies vegan-friendly and suitable for lactose-free diets. Best of all, they deliver the classic flavor and texture of Christmas shortbread. Buttery and crumbly, these traditional butter press cookies are flavored with almond or vanilla extract, so they smell just as delicious baking as they are to eat. An easy, lovely and simple cookie to enjoy and decorate for your Christmas holiday table. Mexican Tea Cakes (sometimes called Mexican Wedding Cakes) are actually tender little cookies with a texture and taste that's similar to traditional holiday shortbread. With their buttery flavor and irresistible powdered sugar coating, this cookie recipe is a must for any Christmas or holiday party. Traditional macaroon cookies are a Hanukkah holiday favorite, and a welcome treat at any cookie exchange this festive season. This dairy-free macaroons recipe uses coconut for its sweet, hearty flavor and texture. Serve these elegant, fun little macaroons on your holiday table alongside a pot of tea or hot chocolate, for a yummy treat that kids and adults alike will enjoy. The dough also freezes beautifully, making this a great last-minute cookie when guests drop in! If you love Nutella, you'll go nuts for these chewy cookies that are loaded with chocolate hazelnut flavor. Brownie-like in texture, these chocolate-nut cookies are a great holiday recipe for pleasing the kids at your festive gatherings this year. They're also absolutely delicious served alongside a cup of coffee, for the adults to enjoy after a holiday meal. Dress up your Christmas table or holiday cookie swap with these pretty, elegant little mint-colored meringue cookies. Packed with mint chocolate flavor, and kicked with chocolate chips for an extra dose of decadence, these melt-in-your-mouth meringue cookies are as fabulous to eat, as they are impressive to look at. Homey and buttery, these oatmeal butter cookies make a comforting, yummy treat on a cold winter's day. The good, old-fashioned cookie flavors of butter, oats, vanilla cinnamon and brown sugar make these simple cookies a surprisingly wonderful treat. Cute little Brown-Eyed Susan Cookies are an adorable and yummy Christmas cookie that look pretty and taste so fabulous. Soft, sweet, traditional thumbprint butter cookies are filled with a chocolate candy center, to look like Brown-Eyed Susan flowers. Giant cookies with both dark and white chocolate have more to love. Kids and adults alike will delight in these huge double chocolate chip cookies. Easy recipe is fun for the kids to help you make, too! Here's a super quick and easy cookie recipe that you can bake up in about 30 minutes, when a last minute Christmas party invitation arrives and you want to bring along something homemade. Rich and chewy cookies loaded with chocolate make a simple, wonderful treat for holiday parties. We mean it when we say this is the best chocolate chip cookie recipe! You're sure to earn a reputation as an accomplished cookie baker when you share these cookies that blow other chocolate chip cookie recipes out of the water. Two kinds of chocolate chips and oatmeal combine with other traditional cookie ingredients to create an incredible chocolate chip cookies that comes out golden, crisp and chewy, with an intriguing bit of crunch. Set out a batch of these wonders at your holiday cookie swaps and watch them disappear. Peanut butter cookies are a year-round favorite and are so delicious with a big glass of milk. Bake up a batch of these amazing flourless cookies with our easy and delicious recipe. You can also add chocolate chips to the recipe, if you like, for a peanut butter cup flavor. Who could resist these sweet little crescent cookies, coated in powdered sugar like freshly fallen snow? This traditional Czech vanilla and almond cookie recipe is popular all year round in Europe, but is especially beloved at Christmas time. They'll fill your kitchen with an almond, sugar and vanilla scent that's just fabulous. If you're running a bit behind, but still would like to bake an impressive batch of cookies for your holiday cookie swap, these Sugar-Free Peanut Butter cookies are your saving grace. Made in under 30 minutes with ingredients that are common to most households, the peanut butter, oatmeal, banana, maple syrup and a splash of soy milk make these bad boys a healthier holiday treat. Magic Cookie Bars are a traditional sweet that are perfect for bringing to Christmas cookie swaps, festive potlucks and office holiday parties. Rich, sweet and chewy cookies are made with butter, graham cracker crumbs, and layers of chocolate chips, pecans, coconut and sweetened condensed milk. Russian Tea Cakes (also called Moon Cookies) are a traditional holiday treat. Here's a recipe for vegan-friendly Russian Holiday Tea Cakes that everyone in the family can enjoy. Have more fun with these Blondie cookies that are moist, chewy, delicious and loaded with sweetness of brown sugar and chocolate chips. Chocolate Chip Blondies are a favorite cookie for kids and adults alike at holiday time, and make a great hostess gift. Turrón is a favorite Christmas candy from Spain, traditionally made with almonds. This rich-tasting, crispy, chocolatey version of the classic Spanish Turrón recipe is made with chocolate, almonds and puffed rice cereal, for great texture and crunch. Make this easy recipe like a chocolate bark, by melting the chocolate, adding the other ingredients and refrigerating until firm. Then cut into slices, share and enjoy! Who doesn't love rich red velvet? The same red velvet flavor that's so popular in cakes and cupcakes makes this Christmas cookie a delight to eat. The bright red color makes the cookies perfect for all your Christmas parties and gatherings. 50 States of Christmas Cookies: What Holiday Treat Is Popular Near You? 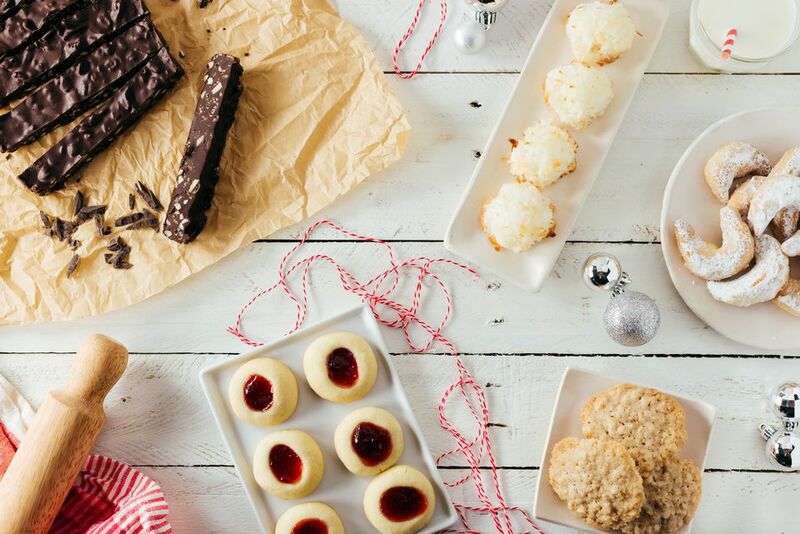 What Are Some Foolproof Dairy-Free Christmas Cookie Recipes? What Are Good Italian Christmas Cake and Cookie Recipes?